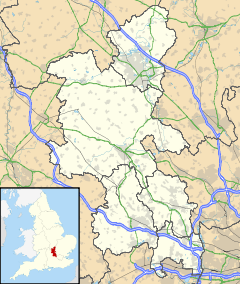 Olney (/ˈoʊni/, rarely /ˈɒlni/ OL-nee) is a market town and civil parish in the Borough of Milton Keynes in South East England. At the 2011 Census, it had a population of around 6,500 people. It lies on the River Great Ouse, very close to the borders of Buckinghamshire with Bedfordshire and Northamptonshire, and equidistant from Northampton, Bedford and Milton Keynes. It is accessed by the M1 at Junction 14 (approximately seven miles), with the closest passenger rail service at Milton Keynes Central and Bedford railway stations (each approximately twelve miles distant). It is a popular tourist destination, perhaps best known for the Olney Pancake Race and for the Olney Hymns by William Cowper and John Newton. First mentioned as Ollanege (Olla's island) in 932, the town has a history as a lace-making centre. According to the Domesday Book the place, later called Olnei, was held in 1086 AD by Geoffrey de Montbray, Bishop of Coutances, as its overlord. During the English Civil War, Olney was the site of the Battle of Olney Bridge. In the late 18th century, William Cowper and John Newton collaborated here on what became known as the Olney Hymns. John Newton, author of the hymn "Amazing Grace," was curate of Olney and is buried here. His guest was William Cowper (English poet and hymnodist (1731–1800)). The town has the Cowper and Newton Museum dedicated to them. The museum was adapted from Cowper's former residence, which was given to the town in 1905 by the publisher William Hill Collingridge (who had been born in the house). Newton was succeeded as curate in Olney by the biblical commentator Thomas Scott (1747–1821). The hamlet of Olney Park Farm to the north of the town of Olney derives its name from a park established in 1374 by Ralph, Third Baron Bassett of Sapcote in Leicester. In 1861 it attained civil parish status, but was subsequently incorporated into an enlarged Olney civil parish around 1931. Olney formerly had its own railway station on the Bedford-Northampton line and the Stratford-upon-Avon and Midland Junction Railway, but passenger services were withdrawn in 1962. Since 1445, a pancake race has been run in the town on many Pancake Days, the day before the beginning of Lent. Tradition records that in 1445 on Shrove Tuesday, the "Shriving Bell" rang out to signal the start of the Shriving church service. On hearing the bell a local housewife, who had been busy cooking pancakes in anticipation of the beginning of Lent, ran to the church, frying pan still in hand, tossing the pancake to prevent it from burning, and dressed in her kitchen apron and headscarf. The women of Olney recreate this race every Shrove Tuesday (known in some countries as Mardi Gras or Fat Tuesday) by running from the market place to the Church of St. Peter and St. Paul, a distance of over 400 yards. The traditional prize is a kiss from the verger. In modern times, Olney competes with the town of Liberal, Kansas in the United States for the fastest time in either town to win the "International Pancake Race". There is also a children's race, run by children from the local schools. The children have to run a distance of about 20 yards. This competition has been run every year since 1950. The A509 road runs into the wide High Street bordered by historic town houses. The Market Place is the site of a general market on Thursdays and a farmers' market on the first Sunday each month. The vast majority of Olney shops are independents, attracting shoppers from further afield to find the galleries, antique, rug and furniture sellers, as well as boutiques for interior design, fashionable clothes and perfumery. There are restaurants, pubs, cafes and takeaways offering a wide variety of British and international food. As Olney continues to expand, with new housing estates, a secondary-level satellite campus, Ousedale School has opened for pupils from year 7 to year 11. Olney Infants School is for reception to year 2 children and Olney Middle School takes the children up to year 6, at the age of 11. The route for an A509 by-pass may continue to be an issue for the residents of the town, as are the various wind farm sites proposed in the locality. Olney is the northernmost town in the South East of England region, close to the boundary with the East Midlands. Olney has for many years been a rugby town, with its rugby team dating to 1877. Called Olney Rugby Football Club, it has four regular senior teams. They also cater for Colts rugby, women's rugby, girls' rugby and mini rugby. The club holds many social events for the town, one of these being a Rugby 7s tournament, with teams attending from all over the country. Olney's rugby is played to a high standard in the English rugby union Leagues, winning the Lewis Shield in 2007, the Southern Counties North League in 2008, and the Bucks Cup in 2010. The town's football club, Olney Town, played in the United Counties League but closed down in 2018. The town also has a junior football club, Olney Town Colts FC. The FA Charter Standard club has 27 teams ranging from U5s to U18s and an adult development team ensuring local players can continue playing beyond youth football. Other sports activities are supported by clubs for cricket, tennis and bowls, and a hockey club for juniors. Clem Curtis, musician, television personality, a member of The Foundations. John Newton, clergyman, slave trader turned abolitionist and writer of "Amazing Grace"
Wikimedia Commons has media related to Olney, Buckinghamshire. ^ Olney and its associations, or, Reminiscences of the poet Cowper. Oxford: University of Oxford. 1880. p. 61. ^ Parishes in Milton Keynes Archived 8 June 2009 at the Wayback Machine – Milton Keynes Council. Wikisource has the text of the 1911 Encyclopædia Britannica article Olney, England. 'Parishes : Olney with Warrington', Victoria History of the Counties of England, A History of the County of Buckingham: Volume 4 (1927), pp. 429–439.